The concept of fair division is as old as civil society itself. Aristotle's "equal treatment of equals" was the first step toward a formal definition of distributive fairness. The concept of collective welfare, more than two centuries old, is a pillar of modern economic analysis. Reflecting fifty years of research, this book examines the contribution of modern microeconomic thinking to distributive justice. Taking the modern axiomatic approach, it compares normative arguments of distributive justice and their relation to efficiency and collective welfare. The book begins with the epistemological status of the axiomatic approach and the four classic principles of distributive justice: compensation, reward, exogenous rights, and fitness. It then presents the simple ideas of equal gains, equal losses, and proportional gains and losses. The book discusses three cardinal interpretations of collective welfare: Bentham's "utilitarian" proposal to maximize the sum of individual utilities, the Nash product, and the egalitarian leximin ordering. 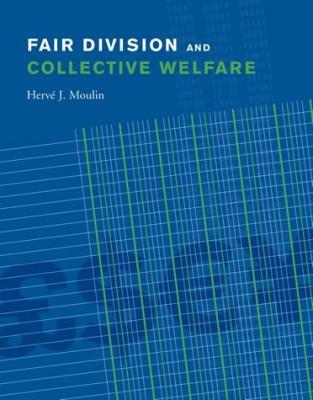 It also discusses the two main ordinal definitions of collective welfare: the majority relation and the Borda scoring method. The Shapley value is the single most important contribution of game theory to distributive justice. A formula to divide jointly produced costs or benefits fairly, it is especially useful when the pattern of externalities renders useless the simple ideas of equality and proportionality. The book ends with two versatile methods for dividing commodities efficiently and fairly when only ordinal preferences matter: competitive equilibrium with equal incomes and egalitarian equivalence. The book contains a wealth of empirical examples and exercises.